ePublishing Knowledge BaseePublishing Knowledge BaseePublishing Knowledge Base AdvancedHow do the related widgets on my site work? Related Widgets have the ability to surface associated content that may have some connection with the main content. This association can be either automatic or manual. 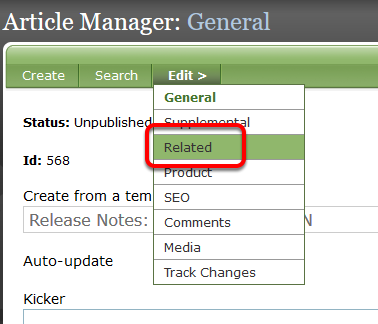 First we show the manually related content selected when you created the initial article, blog post or other content. Related Subform controls the manual associations (Article Manager shown). All remaining slots are filled with the automatically related content. Learn about automatic association of content in this article: How do the automatic related widgets on my site work? Prev: How do I restore a taxonomy that has disappeared?